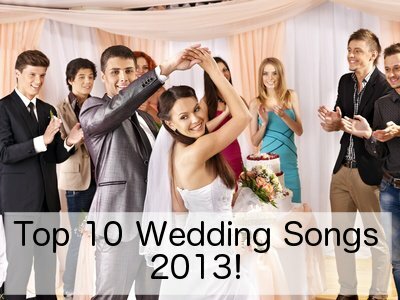 Time has come to plan your wedding reception songs. So, where exactly do you need to plan music for? How much and what kind of songs? 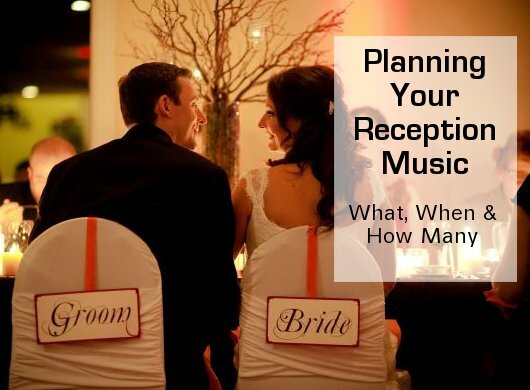 Below is a breakdown of where, how and what songs you should have for every part of your wedding reception. Of course this will depend also on how much you want to stick to tradition, so it is all up to interpretation. This is your pre-reception music. Generally it is played at the reception venue, outside (if it is nice weather), or in another room (other than your dinner area). The bride and groom are usually not present during the bulk of the cocktail hour because they are taking their official photographs. You will need around 1 and a half hours of wedding reception songs to make up your cocktail hour playlist. It is called cocktail "hour" but it is always good to have more music than necessary. This amounts to around 22 or 23 songs. 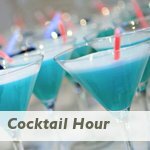 Check out some suggestions for great cocktail music playlists. This is the song that officially announces you as husband and wife as you arrive at your reception venue ready to celebrate your union. You only need one song here, and this is one of the wedding reception songs that can be a very personal choice, but make it count. 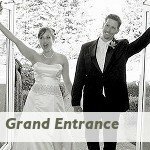 Click Here for some choices on great entrance songs. 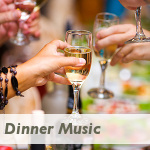 You definitely need some background music while you and your guests enjoy your dinner. It does not matter if you are having an informal, hors d'oeuvres style wedding, a buffet dinner or a formal, served meal of several courses. Plan for between one and a half to two hours of music. Find some great selections and tips here. Yes, believe it or not, you need a song to play while you cut your wedding cake. Many couples think that just anything that is playing in the background would be fine, but trust me, a great song picked especially for this occasion really makes it something memorable. Here is a list of more than 30 cake cutting songs of all genres. Or do you want something fun and upbeat? Here is our top 10. Looking for something country? 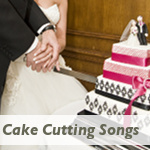 Here is our list of 10 country cake cutting songs. Often referred to simply as your "wedding song", this song needs no introduction and you perhaps already have a special song to use for this moment when you open the dance floor officially as husband and wife. 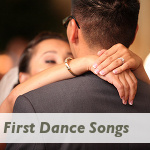 Our list of more than 100 first dance songs from all genres. 10 New songs for your first dance. For some unusual (and not overused) choices, click here. Looking for something country? Our list of more than 30 Country Songs. Learning a ballroom dance for your first dance and looking for an appropriate song to dance it to? Click Here for suggestions. This is one of those wedding reception songs that can be as tear jerking or as funny as your personal tastes allow it to be. For more info and some great choices of songs from all genres click here. 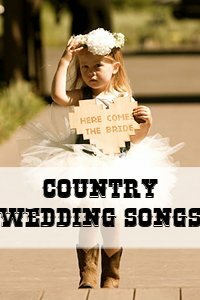 If you or your father love country music, choose from our selection of great country songs for your father and daughter dance. This, like the father and daughter dance is one of the wedding reception songs that is optional, and most people will not frown and wonder why you did not include it. 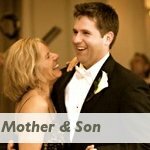 It is however a nice tradition to honor the mother of the groom. Here are some nice choices from many genres. If you are looking for some fun alternatives, click here. I know many brides to be hate the idea of the bouquet toss, but it can be a lot of fun and there are also some really lovely alternatives. So, if the idea of seeing your single friends fighting over your bouquet is not your idea of fun, find an alternative before deciding not to include this tradition. 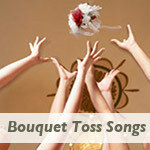 For tips, alternatives and great bouquet toss songs, click here. This is another wedding tradition that is despised by some and loved by others. Before you decide to leave it out of your wedding, find out about alternatives and how to make this a memorable and fun event. 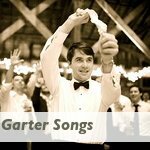 For some great garter toss songs as well as alternatives and tips, click here. If you intend to have some dancing at your wedding, then you definitely need to give some thought to your playlist, unless you want to leave it all up to your DJ or band. The amount of music you will need will depend on whether you want to dance till the sun comes up or end the night at some point. Generally, 4 hours of music should be more than enough. For a comprehensive list of dance songs, click here. 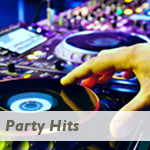 For some tips on how to have a great wedding reception party, follow this link. This is another one of those wedding reception songs that is optional. Some couples prefer to be the last people left at their reception, but mostly, if you need to end the night at some stage, it is nice to end it on a high with a great last dance song. I would recommend up to 4 songs for this, depending on how you want to do it. 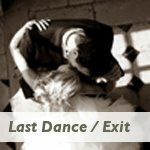 Maybe one song to finish the dancing (last dance), another song to use as an exit (if you have many guests you might need two songs for this or one long song). The exit can be a tunnel of arms formed by your guests with hugs and kisses as you pass through, or a tunnel of sparklers. The sparklers will go quicker, whereas the hugs and kisses take time. Then have your band or DJ play one last song at half volume just to conclude the evening as your guests make their way. Find some great choices here.